Continuing the art and history focused review of the Showtime series The Borgias, this week's episode continues on from the events of the first double length episode which was set in 1492, the year of Rodrigo's accession to Pope. 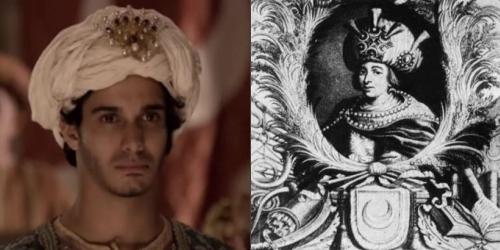 Students of Renaissance and Ottoman history will find this episode a bit disappointing from the perspective of historical accuracy, but there is still much that is interesting to make it worth watching, including a nice helping of art history references. The episode is titled The Moor, a reference to the presence of Ottoman Prince Cem(pronounced Jem) in the Borgia household. Whilst Moor is actually a term for the Islamic populations in Spain (derived from the Roman provincial name Mauritania), it was common in Italy to call anyone of darker complexion Il Moro - hence this nickname may have been applied to Cem as well. The writers have contrived a story around this quite real character from history to forward an element of the plot concerning Lucrezia's impending marriage. Whilst it was interesting to see Cem brought to life, elements such as his desire to convert to Christianity and his poisoning by the Borgia for dowry payment are not present in the historical record. There is an enduring mystery surrounding Cem's death, but historians are not able to prove anything conclusively. Cem does appear in several instances of art in Italy, including a Pinturicchio fresco in the Borgia apartments at the Vatican. It is also important to note that Cem arrived in Rome during the tenure of Pope Innocent VII, not Alexander VI as the show suggests. That aside, it is still an engaging episode. Fans of Renaissance costume and music will find this episode quite delightful. We get another small taste of the creepy dynamic between Lucrezia and her brother in a scene where Cesare vows to protect her from maltreatment by her future husband. The sequence of Lucrezia dancing with her young Venetian suitor, and then Cem was charmingly executed. The scene where Alexander VI is screening suitors is quite amusing as well. I'm starting to think the inclusion of this character has as much to do with the popularity of the Assassin's Creed games as a need to have a nefarious henchman in such a series. Showtime must surely know that fans of the game will be interested in watching this series which overlaps with the historical events in the games. Micheletto is back in this episode, on a quest to kill Cardinal della Rovere. This entire sequence is historical fantasy, and somewhat unusually executed in the episode. Would an experienced assassin really cover himself in mud and try jump in a pool to assassinate his target? The only element that does trickle through from the historical record was that the real Micheletto was also experienced with the garrote, effectively demonstrated on a watermelon in the episode, and later on one of the cardinal's guards. The Neapolitan Last Supper of corpses? I thought I will include this here as it is the type of thing that people will ask about. Della Rovere has fled to Naples and meets its current King, Ferdinand I(also known as Don Ferrante) his son Alphonso II d'Aragon. In a display of what happens with traitors to Naples the Prince takes della Rovere to a room where a macabre Last Supper scene is being created using the stuffed corpses of enemies. Commonly referenced via Jacob Burckhardt's The Civilization of The Renaissance in Italy, this infamous scene is based on apocryphal accounts of cruelties that were said to have been committed by Ferdinand I. The biases of the authors of these accounts must be taken into consideration, as was Burckhardt's flair for melodrama over historical accuracy. The actual Alphonso II d'Aragon is widely credited with bringing Renaissance learning to Naples during his tenure as crown prince. Unfortunately, you don't get any of this from the episode. My favourite part of the Naples sequence was the short glimpse of the seamlessly digitally tweaked landscape shown when Micheletto approaches Naples, with the famous Mount Vesuvius in the background. This actually mirrors a flattering description of one of the grand estates of the Aragon, Poggia Reale, which invading French King Charles VIII described as an 'earthly paradise' with grand views of Vesuvius. There are several references in this episode to challenge and delight Renaissance art fans. Pinturicchio is the artist at the centre of them, and there is a scene showing him painting an equestrian portrait of Juan Borgia, which we have no record of. In the background of this scene is Giotto's famous crucifix at Santa Maria Novella in Florence. Whilst interesting as a piece of set decoration, this particular piece looked quite out of place in Rome, and not in a church. There were a couple of references to Leonardo, including mention of how expensive he is to commission as well as how he rarely completes a project. Sticklers for detail may object to Juan Borgia's calling him the "Milanese mirror painter" - I don't think this is too inaccurate, as it refers to the fact that Leonardo wrote in mirrored writing and was serving the Sforza in Milan during this period. He was of course originally from the town of Vinci, in Tuscany. It is exciting to note we may see Leonardo appear in future episodes, as he was employed by Cesare between 1502-3 as a military engineer. If the show is going to follow Alexander's tenure as Pope, ending in 1503, hopefully this will be covered! It was nice to see the Pinturicchio portraits from the previous episodes appear on the wall - being admired by the family members on a couple of occasions. The Giulia Farnese painting that echoes the later Raphael is shown here too, being painted in profile. We seem to be hurtling towards Lucrezia's wedding. It will be interesting to see how this wedding is depicted and how the dynamic between Cesare and Lucrezia will be affected. I still hope for some mention of Savonarola, and the Medici - who have only been referred to by name thus far. I hope we get to see their representatives in Rome and maybe even get a glimpse of Renaissance Florence as we did of Naples in this episode. Also, whoever that is playing Cem is hot. Which is, er, my scholarly opinion. Ahem. Hi Juliette! It will be interesting to see which actor they go with for that role, assuming the series gets that far of course. I was also excited to hear David Bamber will appear in the series later. Your 'scholarly' comment about Elyes Gabel made me giggle. I'm not sure if he has Turkish heritage(it's not a Turkish name I've encountered before), but he was Canadian born and now lives/works in London, and has been on Brit TV a bit. I haven't watched this show but now I may have to! Thanks for the breakdown. I have had buy the dvds to watch this show, as I have no access to Sky, hence my comments coming so long after it was aired! I have just found this site by googling a question about the veracity of the plaster cannons story. While it was disappointing to find that this did not happen, I love the way the writer explains what is historical fact and what is not, while still finding the show as entrancing as the rest of us. Some historians are very opinionated and dismissive of historical drama on television. My viewpoint is that while I am hungry for historical facts, I love the wonderful writing, acting and photography that brings history to life. Plus, some of the storylines may have no basis in recorded history but give a strong feel for what was likely to have been said and felt based on what we do know. I shall save this site to my favourites .... it is wonderful!